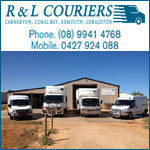 R & L Couriers are complete road transport solutions for freight moving between Geraldton, Carnarvon Exmouth & Coral Bay. We offer a personalised service and can tailor the courier side of your business at highly competitive rates whether you need to transport a single parcel or a whole container. To get a quote call or email us today.